You wiLL be picked up from any directions ( airport, TRAIN station ( Surabaya area), Malang, or Ketapang harbour ( Banyuwangi ), then proceed to your choosen hotel near mount.Bromo. Check in and free program. Early wake up in the morning, our guide will accompany you to go up to mount Pananjakan by four wheel drive ( Private ), to see sunrise. After sunrise, go back to four wheel drive and drive back down to sea of sand. Start walking up from jeep parking area to mount Bromo, on foot or ride a pony and walking up through 250stairs to reach the rim of mount.Bromo. After volcano tour, back to hotel for having breakfast and shower. Check out, then you will be transfer back to Airport, train station or hotel ( Surabaya area ). 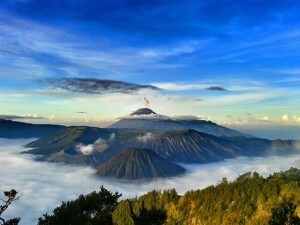 This tour package can combine with our others package, such as Semeru trekking tour, Ijen Bromo Madakaripura waterfall, Ijen Blue Fire, and many others tour package. if any question about our tour package, do not hesitate to contact us.